Most people know the little "lions and tigers" that are so kind to share their home with us are obligate carnivores, meaning they have a biological need for the amino acids found in meat. I bet they invented the question: "Where's the meat?"! It is widely accepted that a cat diet should consist of 50-55% protein, 35-40% fat and only 10% carbohydrate. Sounds a lot like the Atkins Diet, doesn't it? Maybe we should call our cats' diet the "Catkins" Diet! It can be very confusing with the ever-expanding choices of cat food we now have: Dry (kibble), wet (canned), raw (dehydrated, frozen, freeze-dried). However, there seems to be no confusion among the more holistic veterinarians about what/how we should be feeding our feline family members. They strongly recommend our cat companions should be fed a diet similar to their instinctive archetypal diet, which is prey and is 80-90% moisture. Dry food, "kibble," contains only 10% moisture. Cat(s) that eat primarily kibble tend to be in a chronic state of dehydration which puts stress on their bladder and kidneys. Their urine can become very concentrated which makes it easy for crystals to form, especially when their dry food contains by-products, lots of carbohydrates/starches and other questionable ingredients from slaughter houses. Even feeding the "healthier, grain-free" kibble can be major factor in the development of chronic kidney disease, which is incurable and shortens their life. Sadly, the incidence of kidney failure is higher with our fur babies than other species. Feeding exclusively dry food also contributes to the development of diabetes, obesity, liver problems, dental disease (teeth and gum disease), IBD and cancer. Check out a great blog on Dr. Jean Hofve's website: www.littlebigcat.com about why dry food is bad for cats AND dogs. She also has an informative and best-selling e-book, What Cats Should Eat. So, we should be offering our cats a diet which contains about 65% moisture, 50-55% protein, 35-40% fat and only 10% carbohydrate. It is highly recommended that we rotate our cats' protein source every 3-4 months which may help in preventing allergies. Cats in the wild, and outdoor cats in neighborhoods, don't eat the same bird or rabbit or squirrel every day! Become a label reader and researcher, if you aren't already, because not all protein sources are equal. Some cat foods offer a decent amount of protein (think feathers, hair, etc.) but are low in biological value because they are difficult to break down into the kind of amino acids our cats desperately need. Freeze-dried diets for felines are almost identical nutritionally to frozen raw food. The obvious difference is the moisture content, which you will increase when you hydrate the freeze dried food. Dehydrated cat foods are technically not raw, due to use of low heat to evaporate the water. However, the nutrient quality remains high enough that some consider dehydrated pet food to be equivalent to raw pet food. Freeze-dried or dehydrated pet food is usually costs quite a bit more than other types of pet food but remember: 1 pound of dehydrated or freeze-dried pet food, when hydrated, equals 3-5 pounds of fresh food. You can also offer your cats healthy wet food in cans or pouches. Again, be a label reader and avoid any products containing wheat, corn, soy, or by-products of any kind. Please consider also avoiding products containing carrageenan or other binders/thickeners. There are a number of consistencies of canned food now, such as paté, sliced, diced, minced, chunks and gravy, shredded, geleé and loaf. However, a nice moist paté, seems to be most widely accepted. Only offer a small amount of the new food at first. Don't hover and watch him eat! 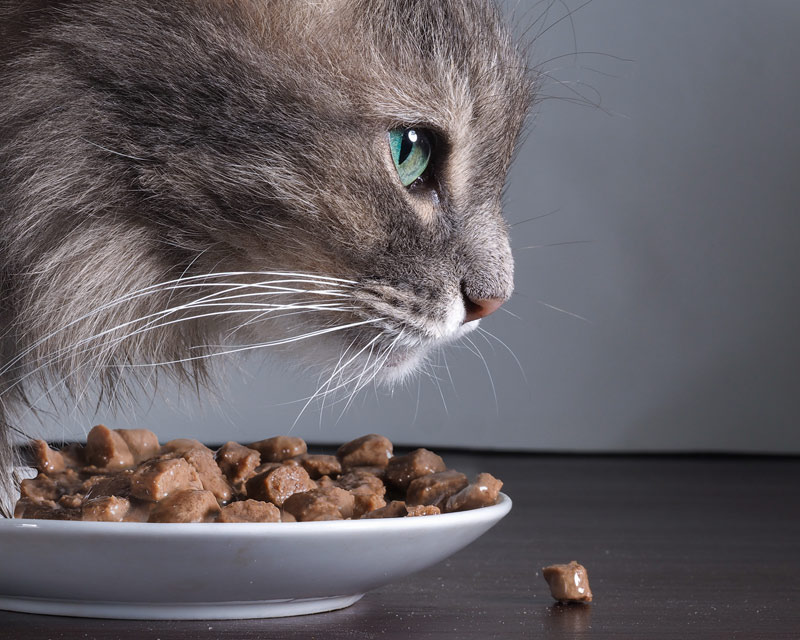 If your cat gives you his approval by eating it instead of walking off, it would be a good idea to blend the new and current food for a week or so and then transition gradually to only the better food. Keep a food diary! This will allow you to save time and money when determining which consistencies and proteins your cat(s) like the best. Please stay tuned for Part 2: How to feed our feline family members!